Environmental Statistics, Assessment, and Forecasting examines the current efforts to develop a coherent picture of national and regional environmental trends and conditions. The book includes sampling methodologies, statistical analysis techniques, environmental modeling, graphic presentation, including geographic information systems (GIS), and the problems involved in forecasting the future. The sampling and statistical techniques discussed include dealing with large variability and soft data; composite sampling; methods for combining data; data below the detection level; multivariate data; spatially censored, artificially censored, and incomplete data; kriging; and imputation. Geographic information system (GIS) analysis is discussed in the context of database management systems. Also covered are topics involved in the future of environmental statistics, including research planning, a bureau of environmental statistics, global interactions, and communication techniques. The book will interest statistical analysts, environmental planners, scientists, regulators, and policy makers in government, industry, and environmental groups. Uncertainties in Assessing the State of the Environment: An Overview of Environmental Statistics Assessment and Forecasting (C.R. Cothern and N.P. Ross). Combining Data and Data Uncertainty: Introduction (C.R. Cothern). Uncertainty Issues of the Hanford Environmental Dose Reconstruction Project (R.O. Gilbert and J.C. Simpson). Decreased Sampling Costs and Improved Accuracy with Composite Sampling (S.D. Edland and G. van Belle). Environmental Chemistry, Statistical Modeling and Observational Economy (G.P. Patil, S.D. Gore, and A.K. Sinha). Predictive Models of Fish Response to Acidification: Using Bayesian Interence to Combine Laboratory and Field Measurements (W.J. Warren-Hicks and R.L. Wolpert). A New Approach for Accommodation of Below Detection Limit Data in Trend Analysis (N.N. Nagaraj and S.L. Brunenmeister). Spatial Chemostatistics: Introduction (N.P. Ross). Spatial Chemostatistics (N. Cressie). Design of the Clean Air Act Deposition Monitoring Network (D. Holland, R. Baumgardner, T. Haas, and G. Oehlert). Considerations in the Analysis of National Air Quality and Emissions Trends Report (B.A. Beard and W.P. Freas). Models and Data Interpretation: Introduction (D. Krewski). Statistical Issues for Development Toxicity Data (D.W. Gaylor). Measuring Carcinogenic Potency (M.J. Goddard, D. Krewski, and Y. Zhu). Environmental Pollution and Human Health: An Epidemiology Perspective (J. Schwartz). Soil Quality as a Component of Environmental Quality (M.A. Cole). Future Environmental Management: Introduction (J. Abe). Gauging the Future Challenges for Environmental Management: Some Lessons from Organization with Effective Outlook Capabilities (M. Boroush). Creating Strategic Visions (C.W. Taylor). Exploring Future Environmental Risks (D.W. Rejeski). Geographic Information Systems (GIS): Introduction (A.M. Pesachowitz). Geographic Information Systems (GIS) for Environmental Decision Making (A.M. Pesachowitz). Mechanisms to Access Information about Spatial Data (E.J. Christian and T.L. Gauslin). 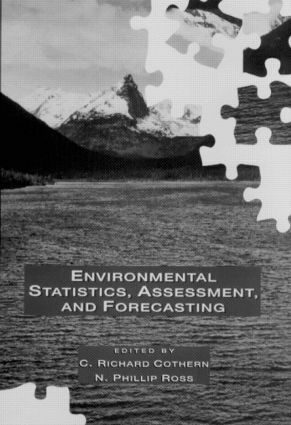 Environmental Statistics: Introduction (B. Nussbaum). The Quality of Environmental Databases (D.A. Marker and S. Ryaboy). The National Oceanic and Atmospheric Administration (NOAA) National Status and Trends Mussel Watch Program: National Monitoring of Chemical Contamination in the Coastal United States (T.P. O'Connor). Some Problems of "Safe Dose" Estimation (A.P. Basu, G.F. Krause, K. Sun, M. Ellersieck, and F.J. Mayer, Jr.). Where Next? Adaptive Measurement Site Selection for Area Remediation (H.T. David and S. Yoo). The Center for Environmental Statistics: Interim Status and Vision of Products (B. Niemann, C. Curtis, and E. Leonard). Conclusion: Environmental Statistics: Where Do We Go from Here? (N.P. Ross and C.R. Cothern). Index.